Corbin here, just filling out a brief status update. We’re back up and running, as far as I can tell. I haven’t found anything broken in a few hours, so I’m moving us from “everything is broken and also on fire” to “any problems you may see are actually features in disguise” mode. This is the official post-mortem. The short version: Some hardware failed. This is a completely natural thing. Due to some awkwardness and a lack of proper preparation on my part, we weren’t able to immediately get back up on our feet, but I just want to stress that this was an act of God and not something we could have guarded against any better. Please don’t email flames to Dreamhost; they’ve been really great throughout the process and gave us a pretty good turnaround for a weekend failure. Thank you for flying Manly Air, and we look forward to many more comics with you all! Long story Short, Dreamhost had a hardware crash that killed the site and lost a bunch of data. The folks at Dreamhost didn’t seem to be doing anything to fix the problem, so internet guardian angels Corbin Simpson and Jon Hayward stepped in and got things running again. The most recent backup we had was from February, so there are still plenty of things to patch, fill, and fix. Please do not send me emails, facebook messages, Tumblr notes, and Tweets asking if I’m aware my page is messed up. The bombardment of people demanding personal explanations when I’ve already made individual posts outlining the situation is more stressful that the outage itself. Thank you. They’re awesome because they’re only like ten bucks and they’re super cute and they make everybody happy so they’re pretty much the perfect present for anybody who loves squids (by which I mean they’re pretty much the perfect present for anybody) They’ve got a bunch of shirts and stuff too! All equally adorable. 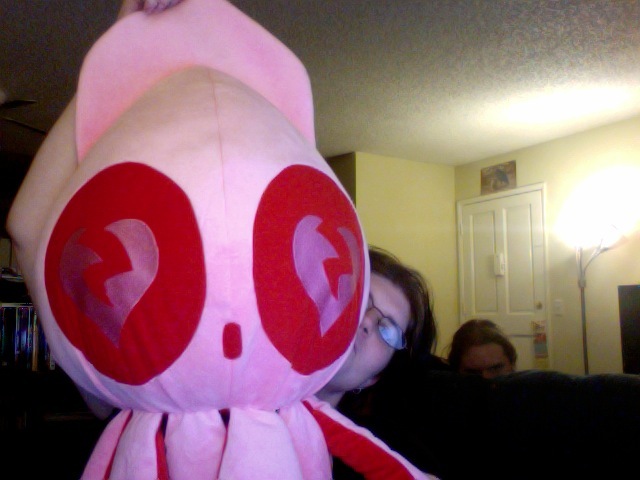 Everything is designed and produced by Nate Mitchell, who has been the sweetest guy to deal with in ordering stuff (I had to get something sorted out with the address on one of the giftsquibs I got and he was really quick and friendly about getting back to me!) so if you buy his swag you can feel all content that you helped out a self-made independent designer and generally awesome bro! The store is over here at Bigcartel, and he’s got a blog of his exploits over hereabouts! Thanks guys! 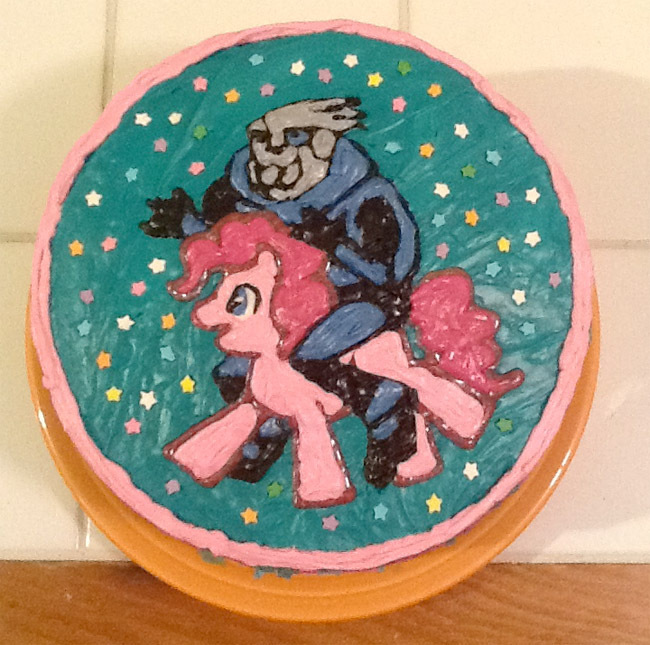 While I draw the comic that I was supposed to have made on Sunday, I invite you to enjoy this three-layer marbled chocolate-funfetti cake featuring Garrus riding through the cosmos on Pinkie Pie that I made instead as a birthday surprise for my friends Balactus and Captain MAAAN of the Harbinger Podcast and their celebratory Bioware Birthday Bash episode (that I got to participate in). Because I’m that kind of a friend.